Wow! I seriously can’t believe I just got an award! This is the first award I’ve ever gotten for something I cared about and I am so happy that I was nominated! I was nominated by the amazingly awesome bloggers Angelina and Jessica, over at My Crazy Reading Obsession. Thank you so much for nominating me! Thank y’all so much! -Nominate 15 other bloggers relatively new to blogging. -Let the bloggers know that you have nominated them. -Share random 10 facts about yourself. -Thank the person who nominated you and post a link to their blog. 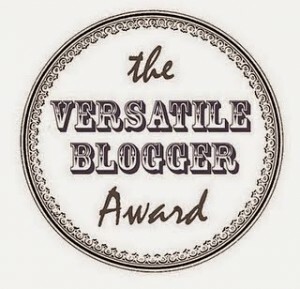 -Add the Versatile Blogger Award picture to display on your blog. 2. I’ve joined so many fandoms it’s hard for me to keep track. 3. Harry Potter is the reason I love reading as much as I do. 4. I have a long haired dachshund, she is my child. 5. I’m twenty something but still look like a teenager. 6. My little sister and I act just alike. I sometimes call her my mini me. 7. I have to have a shirt from every fandom that I join. At least I try to get a shirt for every fandom that I am in. 8. I have horrible social anxiety and the internet is the only place I can talk to people without getting anxious. 10. I believe in aliens.